We understand that as doctors you are extremely busy and have to juggle between your practice, conferences, CMEs, and personal life. As a result, there might be times when you are not able to meet patients for their appointments or miss important events. You can now ensure that patients have a seamless experience at your clinic by preventing appointments being booked for the time slots when you are not available. We are introducing the ‘Block Calendar’ feature which will help you prevent patients from making appointments during the days when you are on a holiday or away at a conference and draw a clear distinction between reminders and blocked events. It is extremely simple to use. You can either click on the ‘Block Calendar’ button on the left side of your screen, or click on an appointment slot on the Calendar. Then enter the details of the time and date of your unavailability, and save the changes. That’s it! How will it benefit your practice? Using the ‘Block Calendar’ button ensures that you are able to provide the best possible experience for your patients and your practice thrives with better relationships! Learn more about how to use the Block Calendar feature on v6 here and on v6.9 here. 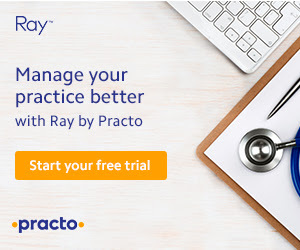 Doctors who are using version 6.9 of Ray have an additional feature. In addition to the Block Calendar feature, we are introducing the Reminder feature that allows you to set up reminders. These could be for All Day tasks or for Custom times. All Day reminders, such as a birthday reminder, will appear at the top of your day’s activities on your Calendar, and Custom reminders, such as reminder to make a call, will pop up at the specified time and appear next to that time slot on your Calendar. Click on the ‘Reminder’ tab from the pop-up window that appears when you click on a time slot. Enter the details of the reminder and save the changes. Using the ‘Reminder’ feature ensures that you are able to manage your daily schedule better and ensure you don’t miss the little details. Learn more about the Reminder feature here. Please note that these features are currently being released in phases and will be made available to all Ray users soon. In both version 6 & 6.9 of Ray, there is a question mark symbol at the top right corner of your screen. Click on this and in the window that opens up check your ‘Plan Detail’. It will be stated here whether it is v6 or v6.9.